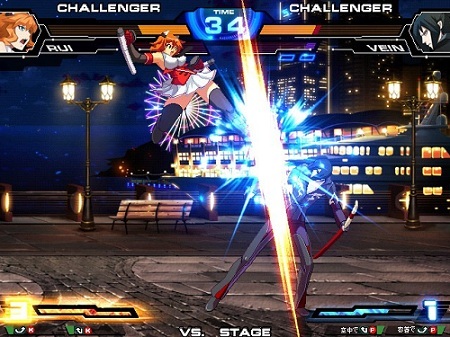 Sega’s new fighting game, Chaos Code, was in tow at AOU earlier this week. The game is being developed by FK Digital for arcades and there is no info on any possible ports. Sega is touting the game as simple to control, with beginners being able to pull off combos easily. Footage of the game in motion can be seen here and here. The game has already seen some location testing in Akihabara last summer. No word on an official release date yet but Sega plans on seeing the game in arcades by this summer. Not bad! Kind of reminds me of the KoF games. Wouldn’t mind seeing this as a console game, either. Yeah it definitely seems KoF inspired. It would be nice if it saw a console port but I don’t think we will know if that’s possible till we see how it’s received.